Non-linear video editing tools are great, but they're not always the best tool for the job. This is where a powerful tool like ffmpeg becomes useful. This tutorial by Elliot Isaacson covers the basics of transcoding video, as well as more advanced tricks like creating animations, screen captures, and slow motion effects. Shawn Powers reviews the HP Mini-Note portable computer. Silicon Mechanics is a leading manufacturer of rackmount servers, storage, and high performance computing hardware. The best warranty offerings available are backed by experts dedicated to customer satisfaction. In today's time of rampant information crimes, including identity theft, security is more important to the average computer user than ever. This tutorial shows how you can use GnuPG to secure and verify data on your Linux box. Shawn Powers has a message for hardware vendors. Listen up! Ubuntu has gotten the spotlight recently here at Linux Journal, but this week Shawn shows us a handful of other Linux distributions. Shawn Powers demonstrates Rockbox, an open source firmware for mp3 players. GoGrid is a new cloud hosting service where you can deploy Linux servers and load balancing in just minutes. Go to GoGrid.com and use promo code GADGETGUY to get a $100 free trial, enough to run 1 or 2 servers for a month and try it out. 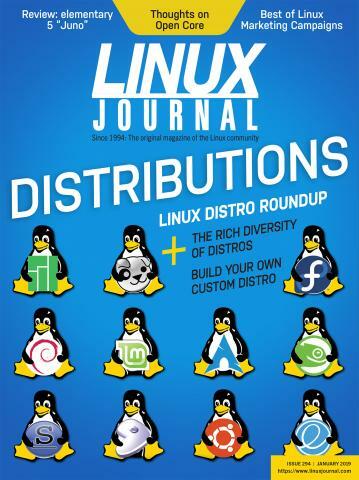 Linux Journal's own Shawn Powers tells the story of Ubuntu and his family of distributions as they search for their identities. Linux Journal Gadget Guy, Shawn Powers, takes us through installing Ubuntu on a machine running Windows with the Wubi installer.